KEZIA Dugdale has reported three online death threats to police including one post suggesting she should be “bayoneted”. The Lothians MSP has joined forces with her political rivals to speak out about online abuse including death threats they receive as they backed a campaign to force Twitter to take action against social media trolls. Ms Dugdale, Nicola Sturgeon and Ruth Davidson have teamed up to support Amnesty’s new “ToxicTwitter” campaign, which highlights the online platform’s failure to prevent violence and abuse against women. 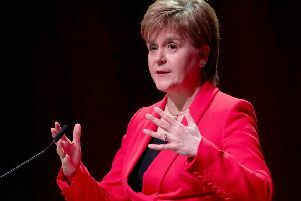 The SNP and Tory leaders and the former Scottish Labour leader have described the distress caused by the misogynist, homophobic, obscene and violent language directed towards them. Along with other public figures, the three MSPs have shared videos of interviews in which they describe the appalling levels of abuse, which is often posted in the foulest terms imaginable. Ms Dugdale said: “There was one particular instance a few years ago now where somebody on Twitter suggested I should be bayoneted. “That was the occasion that I went to the police. I believed that that could be perceived as a violent threat and I felt that it deserved some attention. “Probably ten or 20 times a day I am scrolling through absolute mountains of abuse. There’s different levels of abuse and harassment within that spectrum, some of it very serious indeed. “Three times in the six years I’ve been an elected politician I’ve felt it serious enough to report to the police. That’s involved three death threats in six years. “It’s definitely the case that I get more directly sexist commentary on Twitter and online from men although it’s not always exclusively men. “In Scotland the phrase would be ‘daft wee lassie complex’. She doesn’t know what she’s talking about... she’s too young... too female to really understand what she’s going on about. A selection of abusive tweets about Ms Sturgeon included threats to “lynch” her, threats of sexual violence and four-letter terms of abuse. While as the first openly gay leader of a political party in the UK, Ms Davidson spoke about the importance of challenging the homophobic abuse she receives on Twitter. A new “ToxicTwitter” report concludes that Twitter is failing to respect women’s rights. The report warns the social media company that it must take steps to improve how it identifies, addresses and prevents violence and abuse against women.